You want to have a bunk bed but maybe after a few years, you’ll change your mind and just want to have two separate beds? Luckily, there is something called detachable bunk beds. With detachable bunk beds, you don’t need a lot of time or be a handyman to set them up, most of them are really easy to set up and will take no longer than an hour to assemble which is perfect because who wants to waste their valuable time? 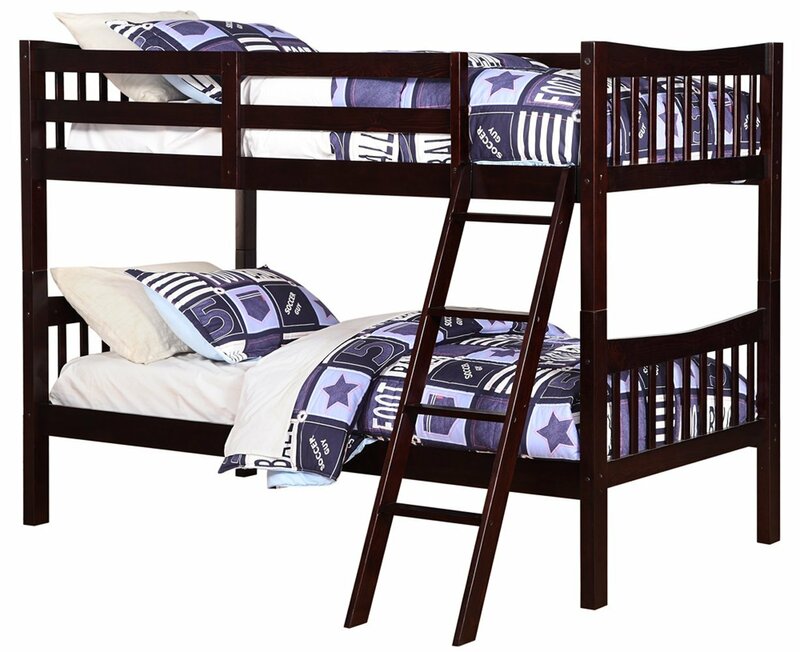 These bunk beds are twin over twin bunk beds and they convert into two separate beds with almost no hassle. Detachable Bunk beds are not that easy to find, but we have done our homework. That’s why we created a list with the top 5 detachable bunk beds for you! The Angel Line Fremont is the perfect addition if you have a small room, as it doesn’t take up a lot of space. It has a classic design and it consists of wood that’ll last a lifetime. It’s really easy to set up and dismantle the bunk bed, it also converts into two separate beds if that’s something you would do in the future. This one is brilliantly designed, and also doesn’t take up a lot of space. It has an easy patent pending quick lock assembly system which allows you to assemble the bunk bed in under an hour. Really safe bunk bed with two integrated 4-step ladders. Beloved for its compact footprint, this bunk bed is a necessity for your children’s bedroom. It’s so easy to set up, everyone can do it and it safely converts into two individual twin beds. The sturdy, steel frame promises stability and function to support up to 250 pounds on each bunk. The Twin-Over-Full Bunk Bed from Dorel Home Products is not that expensive and is the perfect addition to any room. It’s easy to assemble, the bunk bed has been designed for the utmost safety, providing full-length guardrails and a ladder that attaches to the frame. The black metal frame will last through years of rough play, whether hosting twins, friends, family or siblings. 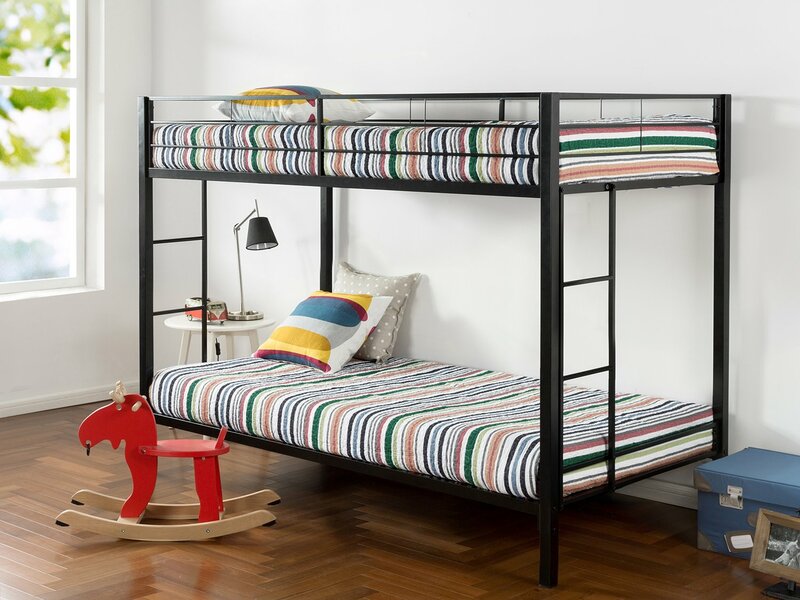 Sturdy Kids Sturdy Twin Over Full Metal Bunk Bed with Stairs. 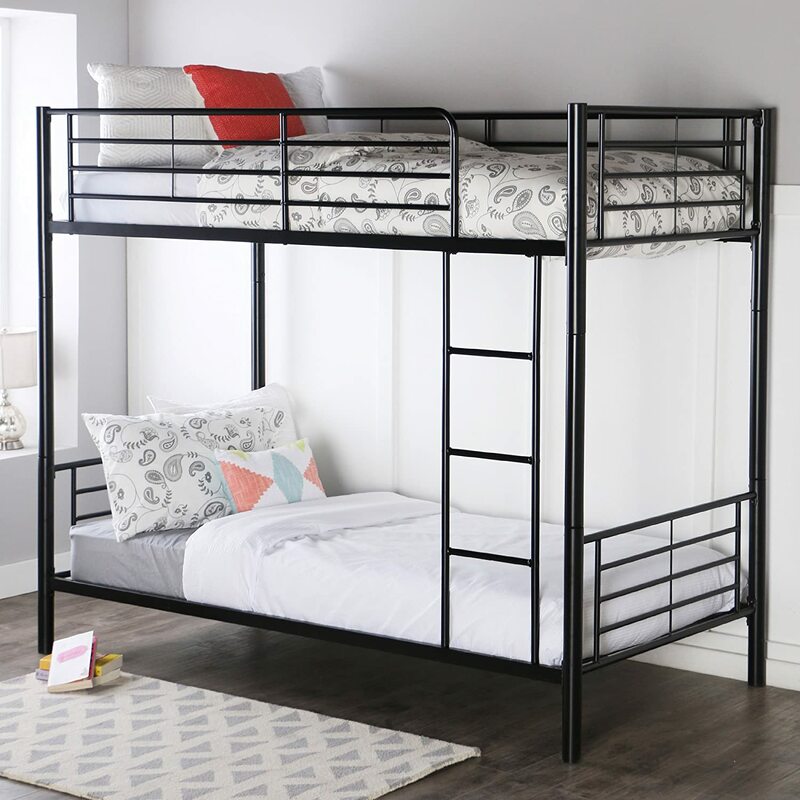 This Durable Steel Frame Bunk Bed For Kids includes full-length guardrails, and the bunk bed does not need a box spring. 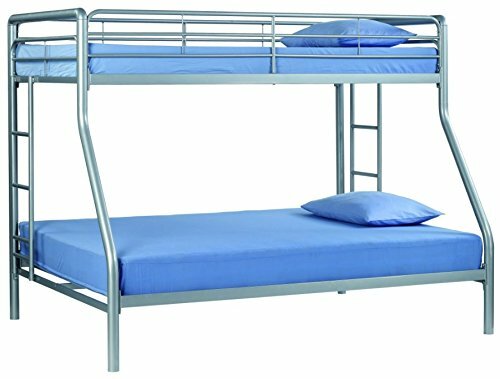 This bunk bed has a really durable steel frame and is included with full-length guardrails, perfectly safe for your children. The bunk bed does not need a box spring. It’s really easy to setup, it’ll probably not take any longer than an hour and if you want to place the bunk bed in another room then don’t be worried because it also doesn’t take that long to demount. Detachable Bunk beds are popular all over the world and many children would like have one of these beds. It’s a great choice for homeowners who would love to save some space in their home. This is because these types of beds are arranged one on top of the other, it would be a great addition to your home. Let’s show you some special features of the best detachable bunk beds out there. Children love to have some adventure in their home so if you give these beds to them, they will be happy to sleep and play in it. Space – The first thing you should consider is the space. Make sure that enough space is present in your home to place the bunk bed. Types of bed – These types of bed come in various types include twin over twin, twin over full, and much more. You must select the one based on your needs. Safety features – Safety of your child is all-important to consider. What should you do for that? Simple, just make sure that the beds come with a guardrail and ladder. If the bed comes with the drawer underneath the bottom bed, it will be good for children to store their toys, clothes, books, and much more. Durability – You should check the durability of the beds, meaning check whether the bed is made from steel, aluminum, or wood. Both the steel and wooden beds give you an elegant look and last long. Multi-purpose – If you choose the futon bed, then you can make it as a couch during the daytime and bunk bed at night. Warranty and price – Finally, make sure that the quality is worth the price and check the warranty of the bed. Detachable bunk beds – Be sure that the beds can be detachable. This is because if your child is too young; there may be a chance to fall from the bunk bed. The detachable option is considered to be really good if your child doesn’t sleep in the bunk bed very often. 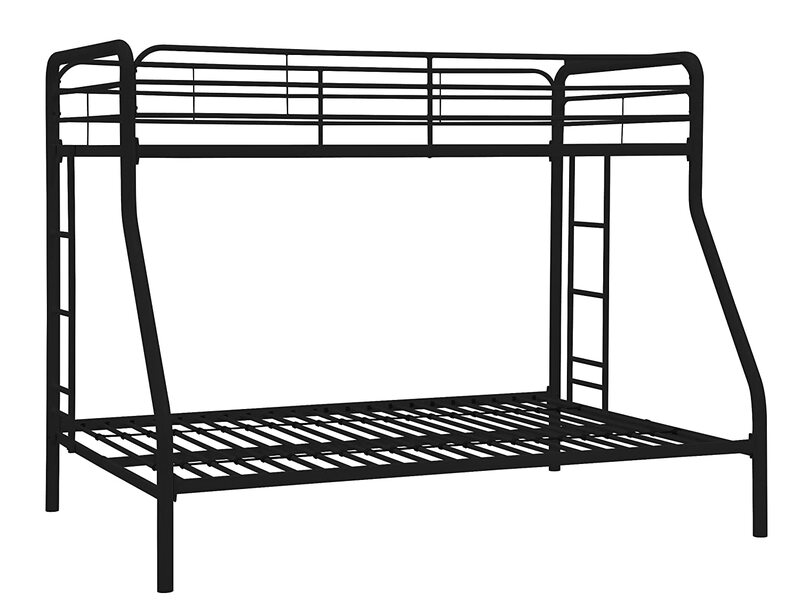 It’s good to use guardrails on two sides of the top bed so your child will be safe during their sleep at night. Don’t let your child sleep in a bunk bed if he/she is less than 6 years old. Tell to your child to not use chairs or tables to climb to the top of the bunk bed. Tell them to strictly use the ladder to go to the top bed. Use night-light in your children’s bedroom so it will be safe for your child to find the ladder in the dark. Consider the above safety tips to keep your child from unwanted injury and remember the above-mentioned tips to get the best deal for you. Can I use detachable railings? Definitely, not! It’s always good to use attached railings. The reason is that the child may accidentally remove the rails so it will make them fall off the bunk bed. One of the most important things you should consider while using a bunk bed is the mattresses. You should carefully buy the mattresses for your child so they will sleep without any interruption. Some bunk beds come with a staircase for enhancing your child’s comfort and safety. If you prefer to buy beds with the staircase, then your child can able to climb to the top bed without any injury. Buy beds with attached drawers and shelves because that will also save some space in your room. Nowadays, the triple bunk beds are also playing a major role and most people are using this in a hostel for saving space. It’s important to consider the cost of every bed and whether the quality is worth your money. Do you have confusion in choosing the material of the bed? Deciding the material of the bed is all up to you. If you want a stylish look to your room, then the wooden bed is good. The metal bunk beds are also good to buy and those are available in different finish include black finish, white finish, and much more. These beds not only come with a ladder on the corner of the beds. There are so many beds come with the ladder in the middle and both sides of the bed. You know most of the manufacturers are providing the bed with mattresses also so this will be a great delight for you and you can save your hard-earned dollars as well. Normally, bunk beds come in various shapes, colors, styles, materials, and so on. Definitely, there is a chance for everyone to decide the right bed. Have you ever wondered thinking about the popularity of these detachable bunk beds? It’s all about its space-saving design. It’s the best choice for those who want to stay in a shared bedroom with enough space. Most probably, the bunk beds are generally designed for children who are more than 6 years old. Some bunk beds can be separated into two different beds, so-called detachable bunk beds. These types of beds can be further used in the near future while your child grows. It’s your responsibility to hand-pick the right bed for your child to provide them with a peaceful sleep during the night.